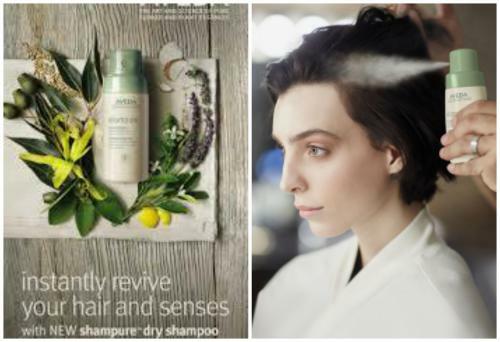 Aveda’s Shampure Dry Shampoo was a focus article in American Salon Magazine’s weekly blog/email….check out what they had to say about this amazing new product and then stop in Pistachio and get your today!!!!!! Aveda’s Shampure Dry Shampoo is a 99.8% naturally derived 1 non-aerosol powder mist that instantly revives and refreshes hair, while rejuvenating your style. Natural powders absorb excess oils and impurities lifting them away from the hair. Aveda’s signature calming shampure aroma with 25 pure flower and plant essences – including certified organic lavender, petit grain and ylang ylang, naturally refreshes hair in between washes. Tip bottle upside down then turn the cap to expose nozzle. Hold bottle upright and lightly squeeze to puff powder at roots. Massage powder into scalp and restyle as desired. Shampure Dry Shampoo is housed in a 2oz/60ml 25% post-consumer hdpe / 75% bioplastic 2 bottle with a pump. The innovative bottle features a non-aerosol “mist” delivery system that closely mimics an “aerosol”for an optimized guest experience.